Florida panther. Manatees. Loggerhead sea turtles. Wood storks. These tend to be the rallying cries of those who would work to save endangered and threatened species in South Florida, the animals who grab the headlines. But the full truth is even more compelling. The fact is that whether on land, in the air or under the water, numerous animals are heading toward the fate of the ivory-billed woodpecker -- a fate known as extinction. At this moment in time, the State of Florida has the third highest number of threatened and endangered species in the United States. The Florida Game and Fresh Water Fish Commission lists 117 animal species as endangered, threatened or of special concern. Another 54 are listed by the United States Fish and Wildlife Service. Their names fill a booklet 14 pages long. Add the 414 plants listed by the Florida Department of Agriculture and Consumer Services, and the picture of a wild Florida -- that attracted so many of us here -- rapidly begins to fade. The news is, thankfully, not all bleak. But the truth remains that it is not “just” the panther, manatee, loggerhead and word stork whose survival rests, largely, with us. The key, as is so often the case, is education. In that spirit, we present three species you may want to get to know -- before they disappear. Extinction -- to be gone from the earth forever. Endangered -- in danger of extinction due to a critically low population and serious loss of habitat; survival is questionable without active assistance now. Threatened -- likely to become endangered in the foreseeable future if current trends continue; rapid decline of population, habitat and/or range, human disturbance. In mid-February, a very special kind of snowbird begins arriving in South Florida. From seasonal roosts in South America, the elegant swallow-tail kite makes its way to this and just a handful of other southern states, staying until September, nesting and breeding during its visit. Intrigued by their visual beauty and the lack of research about them, Ken Meyer began studying swallow-tailed kites a decade ago. For the last five years, he has worked through the Avian Reserach & Conservation Institute as a research biologist in the Big Cypress National Preserve. With funding from the non-game program of the Florida Game and Freshwater Fish Commission, he has begun to unlock the secrets of these striking, part-time residents -- an important first step in ensuring their survival. About all that had been known about swallow-tails was the historical bad news. Prior to 1900, these birds maintained populations in 16 to 21 states, all the way up the Mississippi River valley to Minnesota. At the turn of the century their numbers began to decline until they were evident in only seven states by the 1940s. Today, the U.S. population of swallow-tails is limited to six southern states, and total population is estimated at about 5,000. Of that, approximately two-thirds make seasonal homes in Florida. "They're a vulnerable species," notes Meyer. "There has been speculation that shooting was a factor in their decline, but the primary reason was probably loss of bottom land habitat. People also collected their eggs. In the 1890s, swallow-tail eggs brought $15 each. They have never regained their (population) numbers or their range." Meyer researched nesting ecology (the habitat required and nest success and productivity) and communal roosting behavior. The second study indicated that adults typically head off on the annual migration before the fledglings. But how the adults and young made it to their seasonal homes in South America remained a mystery -- until a few years ago. "All we knew was that they wintered in the northern two-thirds of South America," Meyer explains. "The only way we could follow them was with satellite transmitters, but they were too big. In 1996, we fitted six kites with (new, smaller) transmitters -- this was only the second species we've used them on. And we found they have a relatively narrow migration corridor and a small wintering range in Brazil. We repeated the experiments in 97 and 98, with the same results." Small, of course, is a relative term. In this case, it means an area of about 1,000 by 350 miles. 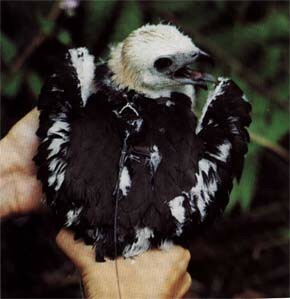 Nevertheless, the accuracy of the transmitters allowed Meyer's research colleagues to find four of the birds within the first few days they took to the field in Brazil. The discovery of a fairly limited range in both hemispheres will allow Meyer and his associates to concentrate their future research efforts. Unfortunately, however, the same factor also means a disconcerting pressure on the swallow-tail population. "The area in Brazil looks a lot like Southwest Florida, but, like Southwest Florida, it's rapidly developing," Meyer explains. "Kites rely on wild lands. By being social, they come back to the same area year after year. If that land is converted to non-wild uses, it will probably be disruptive to the population for at least a year or two." The effects of development are already apparent, both in decreased range and nesting success. Nesting kites almost always produce two eggs, but only about half of the nests fledge even one young. Kites typically nest in the tallest trees (usually pines in this area) to be protected from fire. But hurricanes and other strong winds can eliminate nesting sites. Because kites are not shy around people, it’s theoretically possible that they could nest even in semi-developed areas -- but not if developers uproot native trees and replace them with consumer-favored palms and if surrounding foraging lands are disturbed. The best news on the kite front is that Meyer’s research has led to conservation planning efforts on an international scale, a move that should do much to help the kites survive. "There are opportunities to be compatible with nature," Meyer insists. "We just have to come up with creative ways to meet the needs of both people and animals. Kites are so strikingly beautiful, they're a compelling symbol for conservation of natural areas." If you’ve lived in Southwest Florida for a few years, chances are pretty good that you’ve seen your share of alligators. One of the success stories of the Endangered Species Act, the alligator has made a remarkable recovery in numbers, and alligators can now be commonly glimpsed along US 41, at Corkscrew Swamp Sanctuary, in Ding Darling and at a variety of other area preserves. Not so the American crocodile. Limited in numbers to between 500 and 700 and restricted to the southernmost portion of the state, the reclusive -- and endangered -- crocodile keeps to places that people don’t generally visit. People may think they’ve spotted a croc, but chances are they’ve really seen a gator. And therein may lay the crocodile’s hope for survival. The confusion is understandable. To the cursory glance, the two species, although distinctly different (you’d have to go back some 60 million years to find a common ancestor), look remarkably alike. A closer study, however, points out the differences. The snout of a crocodile is more slender and tapered than an alligator’s, and both its upper and lower teeth are visible when the jaws are closed. 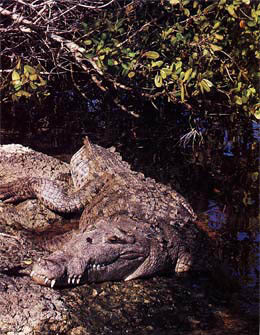 Crocodiles are also lighter in color, appearing more grayish-green than the alligator’s blackish-brown. There are differences in habitat preference, too -- another reason crocs are harder to find. Although neither species is confined to one area, a salt gland on the crocodile’s tongue allows it to linger longer in brackish to salt water. And crocs like it nice and warm -- their only U.S. homes are in Florida. Although as recently as the 1940s, there were reports of crocodiles nesting as far north as Lake Worth, these days their favored haunts range from FPL’s canals near Turkey Point to Key Largo to Florida Bay. Although a top carnivore as an adult, making it to hatching is just one small step on that path. About 50 percent of hatchlings die within the first year. Another 25 percent don’t make it beyond the third year. Add to that mortality rate the fact that American crocodiles -- contrary to common misconception and unlike their African and Australian cousins -- is so fearful of humans that man’s presence can be enough to prompt abandonment of nests, and you have a recipe for extinction. 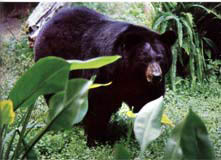 Like the Florida panther, the Florida black bear is a subspecies caught in the bind of development. While the thick impenetrable swamps most favored by bears may remain, the same isn’t true for the surrounding lands bears wander. And bears, like panthers, do like to wander. The area regularly used by one adult male can exceed 66 square miles. That factor is a prime one in explaining why Florida black bear populations have shrunk enough for the species to be state-listed as threatened. While stable populations still exist in Big Cypress National Preserve and the national forests at Apalachicola, Osceola and Ocala, the heavily forested bear habitat between these regions has been and is still being cleared to make way for humans. Isolating the suitable bear habitats can result in gene pool degradation, as related bears end up mating -- the same problem that has led the panther to the brink of extinction. But an even greater danger may be interaction between bears and humans, an inevitability as human populations increase. At about two years of age, male bears begin to be shunned by their mother and forced to find their own range. Without suitable habitat to explore and claim, these young males often wander into urban areas, causing problems and concern. The latter is particularly important, since bears are big eaters -- an average of 11 to 18 pounds of food per day. Although they’re considered large carnivores (armadillos are a favorite), about 80 percent of their diet consists of plant materials, including acorns, cabbage palm hearts and palmetto berries. They also eat insects and are particularly drawn to honey bees. “They’re real flexible in their diet, and they can really gorge themselves when they get started,” Land notes. That’s hardly surprising considering their size -- about 150 to 200 pounds for a female; 300 to 400 pounds for a male. The call for preservation of wild lands has been issued often, for numerous reasons and with some limited success. But far too frequently, the opposing rallying cry is for greater consideration of human needs. Florida is an increasingly popular state and growth is good for the economy. If a few species fall by the wayside, is there really any harm? After all, extinction has been a natural course since the beginnings of life. And what’s to be gained? While the undiscovered potential for human benefit is an often touted argument, “benefits” are often too subtle to be noticed until they’re gone. And there is an undeniable enrichment in sharing space with wild things that defies cataloguing and measuring. As Richardson says of the black bear, “This is an absolutely beautiful animal. It just needs respect. We need to become bear-smart. The harsh news is that extinction has always been a part of life on earth. But the happier reality is, if we do make the efforts necessary to live in harmony with our surroundings, we will have such rewards as being able to watch a swallow-tail in graceful flight or show our children a bear running through the woods. There is a nourishing beauty in these things. It’s a chance to visit where the wild things are. local disappearances have been determined. Range: Seven southernmost U.S. states from February to September (two-thirds in Florida); Brazil from September to February. Habitat: Forested and unforested wetlands and adjacent uplands; nests in the tops of tall trees (usually pines) in wild areas; can coexist in developed areas so long as there are tall trees and expansive wild areas to forage. Eating habits: Feeds primarily on insects; adults will feed fledglings resting bats, green snakes, anoles, tree frogs and nestling songbirds; well adapted to finding hard-to-see prey. Peculiar characteristics: Prior to migration, gather in large roosts of hundreds to thousands; extremely graceful flyers. Remaining population: Estimated at about 5,000. Range: Nests limited to the southern Everglades; individuals have been seen as far north as Charlotte County. Habitat: Brackish to salt water. Eating Habits:A top carnivore, feeding on fish, birds, small mammals and turtles. Peculiar characteristics: Relatively mild-mannered and tend to shun human contact; loner; maternal instincts evaporate fairly quickly after hatching. Remaining population: 300 to 500; producing about 50 fertile nests a year. Range: Big Cypress National Preserve; Ocala National Forest; Osceola National Forest; Apalachicola National Forest; Eglin Air Force Base; other scattered, small sites. Eating habits: Omnivorous, but 80 percent of diet comes from plant material; also eats small mammals and insects. Peculiar characteristics: Usually solitary and timid; excellent sense of smell, very good hearing and can see colors; normally active during the day, although the presence of humans can prompt nocturnal activity. Remaining population: Estimated at 200 to 500 in Collier County. Many of the threatened and endangered animals who encounter the vagaries of life -- particularly the hardship of human interaction -- wind up at the Wildlife Rehabitlitation Clinic, run by The Conservancy of Southwest Florida. The destination is often a fortunate one, as the WRC staff, together with volunteer veterinarians from the county, do their best to help injured wildlife return, healthy, to their homes in the wild. The threatened black bear is a convincing case in point. Since 1994, the WRC has received and treated five of the animals. One died overnight; one had injuries so extensive it had to be euthanized; but three were successfully rehabilitated and returned to the wild. Blood tests and x-rays showed no problems, so the WRC staff began strictly supportive care. By the time he was released, the bear was eating bowl after bowl of food. The second bear brought to the WRC was a 300-pound male who had been hit by a car, two and a half miles east of Ochopee. Suffering from broken vertebrae, he was transferred to the veterinarian hospital at the University of Florida. Unfortunately, his injuries left him paralyzed, necessitating that he be put to sleep. The third bear, also the victim of a car crash on State Road 92, had a happier ending after his October 1997 arrival. Veterinarian Jeff Noble volunteered four and a half hours of his time to set the six fractures in the bear’s jaw. The bear was successfully released in February of 1998. The most recent bear to visit the WRC was yet another car crash victim -- a female who suffered severe internal injuries after wandering onto State Road 92. She died overnight. And so it goes. Sometimes you get lucky and the injuries aren’t too bad. Sometimes they are. But what the WRC staff does in the meantime can make all the difference in the world. And, along the way, the staff has learned a lot. Above all, what helps the WRC efforts to succeed is the cooperation between different organizations and individuals. Staff from the Florida Game and Fresh Water Fish Commission frequently transport bears to the WRC and back into the wild, using specially designed cages. Veterinarians in the county volunteer their time and expertise to treat injuries. And the WRC staff offers the needed supportive care and feeding. “Because all the organisations work together so closely, it all works pretty well,” Fitzgerald notes. Of course, no one would mind if the need for the WRC disappeared completely. But that will only come about as people learn what it takes to live in harmony with our wild neighbors.